I know Autumn isn't technically here until September 23rd, but with the sudden chill in the air and grey color scheme our days have taken on, I can't help but feel like we're already there. Not to mention a few things I have on my personal "Fall Has Arrived" list have also been checked off! One of which is, "When Starbucks' Pumpkin Spice Latte is available". Check! One thing my husband and I do every year during this awesome season is go apple picking up in Oak Glen. We've done it for about the last 4 years and plan on doing it from now on (can't wait to experience it with future kiddies!) To me, apples, apple things, apple scents, apple desserts, apple food, apple anything = Fall. That's why, come this time of year I'm always looking for some awesome yummy and possibly new things to do with the delicious fruit. Sure there's always pie, but it's nice to have a repertoire of recipes to choose from. When I stumbled across this recipe from Ontario Apple Growers, I just couldn't resist. My husband and I are constantly buying Trader Joe's dried apple rings (no sugar or sulfites added what-so-ever. Just good ol' apples) to have as a healthier snack alternative, so to me making my own made perfect sense! And they were SO easy to do! All you need is a little time...well more like 2 hours. :) Here's my adaptation. Enjoy! Core each apple and THINLY slice. Either with a knife, if you're awesome that way, or a mandolin. Cover 2-3 baking sheets with either parchment or silpats. Arrange apple slices on baking sheets- do not overlap or let them touch each other. In a bowl mix ground cinnamon and nutmeg and transfer to a tiny sieve. LIGHTLY dust the apple rings with the mixture. As noted above, try and stick with the sweeter apples. Tart apples like the Granny Smith may need a tiny dusting of sugar on them. 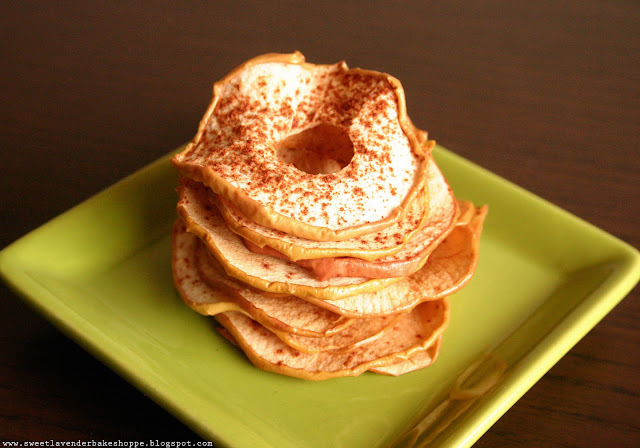 We wanted to avoid sugar altogether and just have a purely spiced apple snack, so we used Gala. Bake for an hour and a half to two hours, checking after first hour and then each 30 minutes after that. They're done with they've shrunk quite a bit, have a slight golden brown color, and are crisp. Remove from oven and let cool COMPLETELY before adding to an air tight container...if you can wait that long. We ate them while they cooled and had about a handful left to put in our container, haha. These will lose their crispiness and turn into rings more than "chips" :) I love dried apple rings, so I was 100% fine with that!